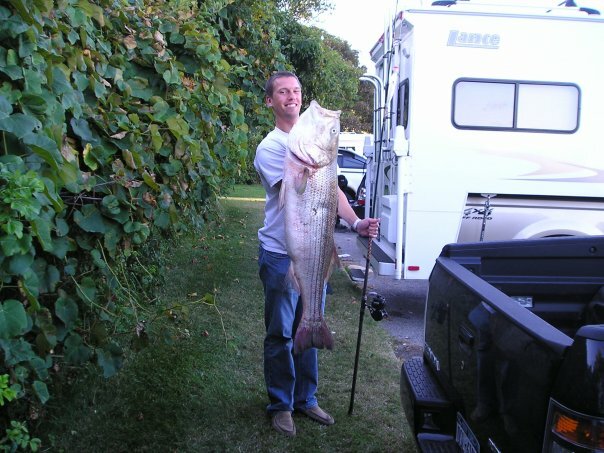 When you think 50lb bass are big, take a look at this monster! Steve took this 65″ Bluefin on the gold Bottledarter. 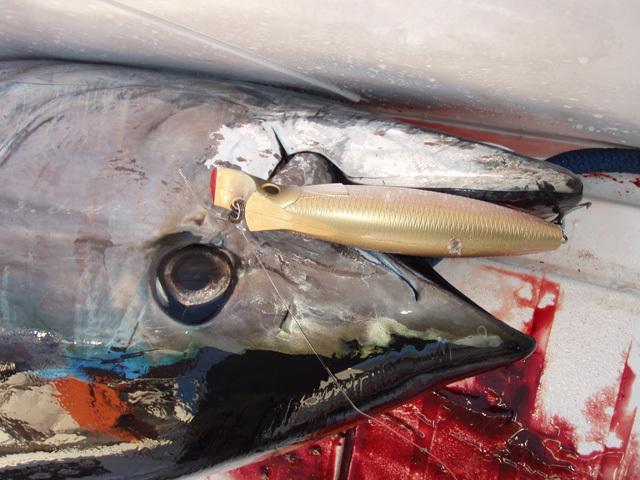 Catching a 150lb tuna on spinning gear….I am definitely going to add that to my bucket list. Congratulations Steve…I am impressed! Congratulations to “JJ”. He landed this 41.7lb fish this fall on the black and purple Bottledarter. Man, that color has been good this year! Tom took 2nd place in the 2009 Korkers cup. The fishing was tough that weekend and Tom managed to land this beautiful fish on the Northbar Bottledarter. Congrats Tom! I have been fishing Northbar plugs since i heard about them. I love the way they dig down in the current and the swimming action. On Tuesday night i hit up a rip that i almost exclusively use Northbar bottle plugs and bottle darters. On this night i was catching bass on almost every drift up to 40 inches but most were like 34-36 inches. At around 12: am i was reeling in the Sand eel wooden bottle darter very slowly and Wham. After the battle my buddy went down to grab it and said go get your scale i think you may have gotten your 40. I catch a bunch of fish quite often but for some reason the big ones always elude me until Tuesday. Northbars are truly great plugs and i have been preaching that for a while. Every one always asks me what i’m using while im outfishing them 4-1. John Stebbins won the 2009 Montauk Classsic with the Northbar Bottledarter! Congrats John. That’s a heck of a fish. Welcome to Northbar Tackle. This page is here to keep everyone updated with company news, pictures, events, and everything else related to Northbar Tackle. We want to thank everyone for their support as we wrap up of first year making the plastic bottledarters! Keep an eye out for some exciting new things next season. On those flat calm nights, the lure can be swam on the surface much like a metal lip. A painfully slow retrieve makes a nice wiggle and produces a surface wake that is sure to entice some nice fish.